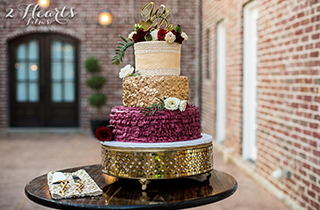 For custom wedding cakes in Forth Worth, TX, Stephen Sweet Sensation is your best bet. With the experience of our specialist, you are sure to have quality specialty cakes, elegant bridal cakes and stunning groom’s cake delivered to you for that special wedding event. Why Stephens Sweet Sensation Custom Wedding Cakes? Custom wedding cakes put the special stamp of personality and style to your wedding. Do not bother about the designs and themes; trust our professionals to wow your guests: this is what we love to do. Feel free to browse our menu for inspirational desert, birthday cake, and wedding cake ideas. Our services are tailored to suit your occasion, style, and budget. Try Stephen Sweet Sensations today and testify to the experience and expertise of our bakery.